The D.C. neighborhood commissioner who said D.C. police slammed him to the ground last week for no reason was arrested Tuesday after his girlfriend reported he attacked her at a grocery store in Maryland. Kendall Simmons was charged with assault and disorderly conduct after his girlfriend told police he punched and bit her at the Wegmans store on the 9000 block of McHugh Drive in Lanham, Maryland. Glenarden police officers responded about 1:30 p.m. The woman said Simmons "became aggressive with her during an argument," punched her in the chest and then bit her left hand so hard that it bled, the police report says. It wasn't immediately clear if the alleged incident occurred inside or outside the store. As officers helped the woman, a U.S. Secret Service agent spotted Simmons inside the Honu Hawaii BBQ restaurant nearby and told police. The agent said the suspect was in the bathroom. As officers approached the bathroom, Simmons peeked out and then slammed the door shut, the report says. An officer drew a gun and ordered him to come out. Simmons screamed and swore as officers forced handcuffs onto his wrists. No information on a lawyer for Simmons was listed in online court records. 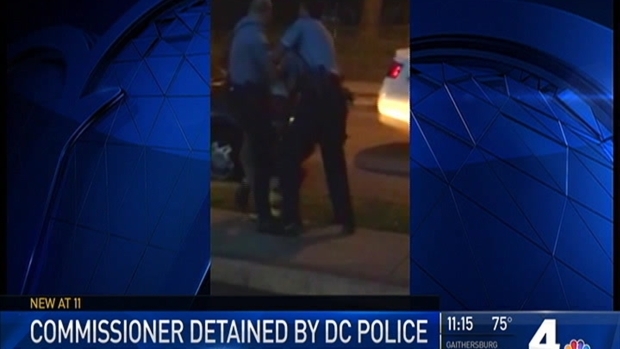 The 27-year-old told News4 earlier this week that D.C. police officers slammed him to the ground and searched him in Southeast D.C. on Friday for no reason. "For them to attack someone that's for the community like I am, you know, it's just sad to see," he said. "They humiliated me in front of my family, friends, you know, my mother, my niece, my nephews," he continued. A D.C. police report says officers believed Simmons may have had a weapon after they say they saw him holding his pants pocket and walking with a limp. The officers asked him to put his hands up, but police say he put his hand in his pocket and refused. No weapon was found, and no charges were filed against Simmons. D.C. police are investigating the incident and reviewing footage from police body cameras. The officers involved are not facing disciplinary action. Southeast D.C. ANC commissioner Kendall Simmons tells News4's Darcy Spencer, he's planning to file a complaint against the Metropolitan Police Department. Simmons says officers put him in handcuffs and forced him to the ground Friday night in Southeast. The police department says it's investigating. Simmons was elected as an Advisory Neighborhood Commissioner in Ward 8. Washington's ANCs are bodies of local government that issue advisory decisions on issues including liquor licenses, zoning and public safety. For the alleged assault Tuesday, Simmons is being held on $2,500 bond. He's due in court Monday.